To set targets manually, there is a simple formula. Click PDF to display a PDF version of this page. Click PRINT to print this page. At the end of week 1, the smoker should be on 1/5 less cigarettes. So if the smoker smoked 20 a day then at the end of week 1 they should be smoking 16 a day. At the end of week 2, the smoker should be on 1/4 less cigarettes. So if they were smoking 16 a day at end of week 1, then they should be smoking 12 a day at end of week 2. At the end of week 3, the smoker should be on 1/3 less cigarettes. So if they were smoking 12 a day at end of week 2, then they should be smoking 8 a day at end of week 3. At the end of week 4, the smoker should be on 1/2 less cigarettes. So if they were smoking 8 a day at end of week 3, then they should be smoking 4 a day at end of week 4. At end of week 5, the smoker should be on 1/2 less again. 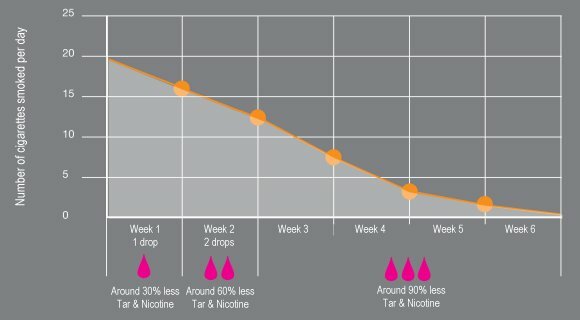 So if they were smoking 4 a day at end of week 4, they should be smoking just 2 a day at end of week 5. By end of week 6 they may have stopped already and if not then this is the time they should be ready to go for their final quit attempt. In the example of a 20 a day smoker, you will notice they are cutting down just 4 cigarettes a week for the first 4 weeks – that is just 1 cigarette less per day every other day – a very easy target for the smoker to achieve. As they are getting less nicotine at the same time, it makes it even easier to achieve the targets. The graph below shows example of a 20 cigarettes a day smoker taking the NicoBloc Challenge.